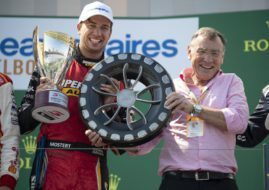 The second round of the 2018 Virgin Australia Supercars Championship, which features four races at the Melbourne Grand Prix Circuit, started with a victory of Scott McLaughlin (DJR Team Penske) in the first 120km race on Friday. Scott McLaughlin started the race from pole in the #17 Ford Falcon and managed to beat reigning champion Jamie Whincup in the #1 Holden Commodore, taking the honour to be the first ever driver to win Supercars Championship race at Albert Park because all the previous races on the circuit were the non-championship events. McLaughlin’s teammate Fabian Coulthard completed the podium, ahead of Shane van Gisbergen (Red Bull Holden) in the fourth place. Chaz Mostert finished fifth in a Ford. Five Holden drivers Scott Pye, David Reynolds, Garth Tander, Nick Percat and Tim Slade completed the top 10. The best Nissan’s driver was Michael Caruso in 13th place. The Melbourne 400 event will resume on Saturday with two races while the fourth race will take place on Sunday just before the Formula One Australian Grand Prix.